Our research team at Monash University conducts research across a wide range of areas important to workplace health and safety. We have collaborated with many organisations to design, conduct and report on high quality research that addresses important practical problems, and is rigorous, ethical, collaborative, and impactful. For more information about our research, see our reports list below. This report presents results from a larger survey that was conducted with members of the Australian Nursing and Midwifery Federation (ANMF) (Victorian Branch) in April and May 2014. The focus of this report is on respondent perceptions of post-incident support following their experience of occupational violence and aggression (OVA). By investigating the barriers and challenges related to the reporting of OVA, this report identifies areas for the development and implementation of policy, workplace-based strategies, evaluation and research focused on OVA. This report presents the results of a follow-up validation study of the Health and Safety Inspector Checklist (HaSIC), a brief tool that can be used by inspectors to assess the potential of workplaces to keep everyone healthy and safe. For details of the initial trial project, see the 2016 report ‘Development and Testing of the Health and Safety Inspector Checklist (HaSIC)’. This follow-up study provides important evidence showing that the HaSIC has sound predictive validity as demonstrated by the findings that initial ratings by inspectors using this tool are predictive of a number of subsequent WorkCover claim outcomes. The findings demonstrate that the HaSIC has very good psychometric properties with the potential to: 1) assist inspectors and the health and safety regulator to identify workplaces most at risk of OHS incidents; 2) standardise the inspection process; and 3) enhance the development of new inspectors with limited tacit knowledge. 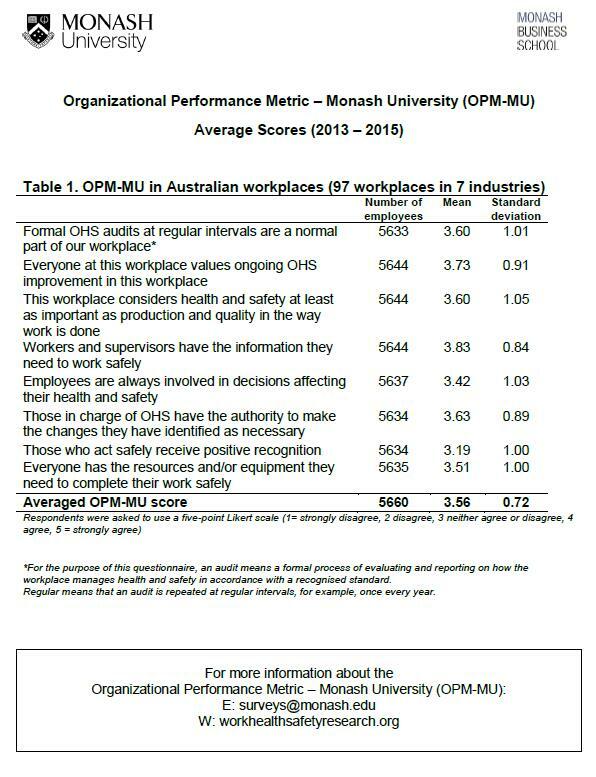 This report presents a summary of all stages of the OHS Leading Indicators Project and information about the Organizational Performance Metric – Monash University (OPM-MU). This report presents the development and testing of the Health and Safety Inspector Checklist (HaSIC), a brief, generic OHS checklist that could be used by inspectors in their evaluations of worksites. This report presents the results of the Workplace Health and Safety (WHS) Survey with 3605 workers, supervisors and managers in 66 workplaces in six industries. This report shows results of Occupational Health and Safety (OHS) Survey, with responses from 4,750 members of the Australian Education Union (AEU) (Victorian Branch). 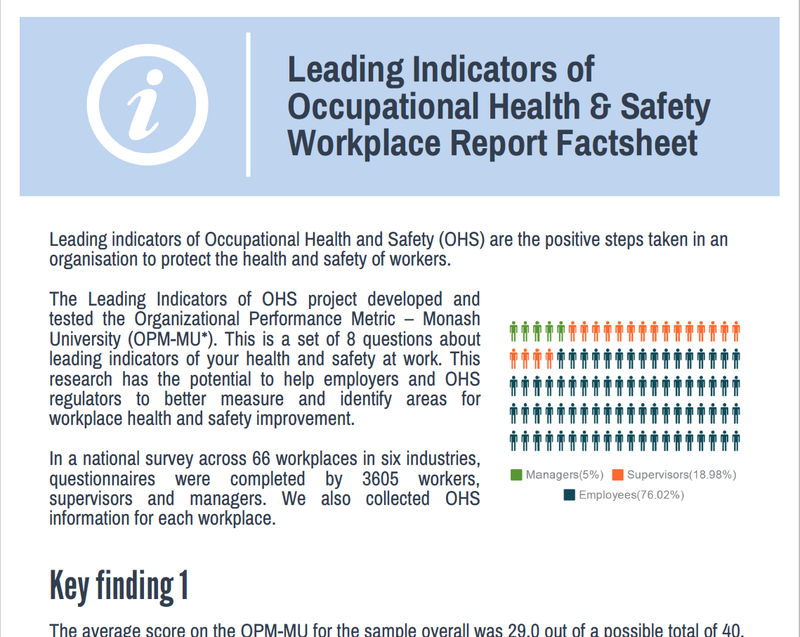 This report compares key results of Occupational Health and Safety (OHS) surveys with ANMF and AEU members, focusing on safety climate, OHS leadership and workers’ engagement in safety. This report compares key results of an Occupational Health and Safety (OHS) survey with ANMF members working in aged care facilities and public hospitals. This report shows results of a brief survey with responses from 639 attendees at a session in the WorkSafe Victoria Health and Safety Week 2015 Health and Safety Representatives’ Conference. This report presents a review of the literature on leading indicators of OHS and identifies and evaluates scales that measure this construct, including the IWH Organizational Performance Metric (IWH-OPM: Amick, 2010; IWH, 2011).